This diagram is a side view of the insert with dimensions. Lots of people have written to us asking for the dimensions of the Thumler's Model B rock tumbler barrel and for the dimensions of the rubber liner and lid gasket. Some people want this information to determine if the dimensions of this barrel are appropriate for the objects or materials that they want to tumble. Others want to know if the barrel or its liner can be used with a tumbler or barrel that they purchased a long time ago. We have prepared the illustrations on this page to give you easy access to this information. Over the 60+ years that rock tumblers have been popular, many companies have manufactured barrels with a design that is similar to those produced for the Thumler's Model B Tumbler. Do not assume that the liner that we sell will fit your tumbler - even if your barrel looks like the one sold with the Thumler's Model B. It probably will not fit. Please use the diagrams on this page and carefully compare their dimensions with the dimensions of your barrel. We do not have parts, barrels or liners for large capacity tumblers made by other manufacturers. If you need a barrel liner or other parts for large capacity tumblers made by Covington, Diamond Pacific, or Lortone the folks at Minnesota Lapidary Supply are often able to help you. This diagram is a top view, looking down into the hexagonal opening of the barrel liner. The outside diameter of the liner is nine inches. The inside measurement from the center of one hexagonal side, across the barrel opening to the center of the opposing hexagonal side, is approximately 6.5 inches. The six cut-outs that accommodate the bolts used to tighten the lid onto the barrel are 1/2 inch wide and about 3/4 inch deep. The inside dimensions of the barrel are important if you are tumbling large objects or you need to know the capacity of the barrel. This diagram shows the size of the lid gasket and the positions of the holes that accommodate the bolts used to tighten the lid onto the barrel. The dimensions of the metal barrel and its lid are shown on the red diagrams immediately below the next paragraph. The dimensions of the rubber barrel liner (top view and side view) and its lid gasket are shown in the black diagrams on the right side of this page. Please study the diagrams and measure your barrel carefully before ordering. Barrels and liners that have been used can not be returned for a refund or credit. Barrels, liners and other parts for the Thumler's Model B tumbler can be purchased on our Model B parts page. This diagram shows the outer dimensions of the Thumler's Model B barrel with the metal lid removed. This diagram shows the dimensions of metal lid for the Thumler's Model B rock tumbler. The inside of the barrel has the shape of a right regular hexagonal prism. It is is approximately 8.125 inches deep, with twelve hexagonal edges that are each about 3.75 inches long. If we solve for volume using the formula shown below the result is about 300 cubic inches. As a familiar comparison, one U.S. gallon is 231 cubic inches, so the Thumler's Model B barrel has a liquid capacity of about 1.3 gallons. The hexagonal prism in the illustration above shows the approximate internal dimensions of the barrel liner. It has a depth of about 8.125 inches, each of the twelve hexagonal edges are about 3.75 inches long, and the distance from the center of any hexagonal face to the center of the opposing hexagonal face is about 6.5 inches. These are the dimensions that you should consider if you are going to tumble large parts. 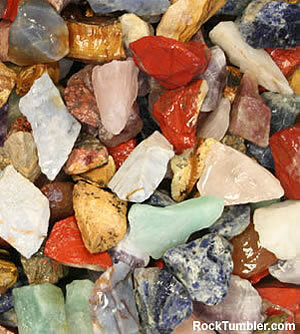 A photograph of our SuperMix rough that works great in the Thumler's Model B tumbler. If you are going to tumble large rocks, you might be able to tumble two or three rocks of about 3 inches in diameter if they are absolutely swimming in ceramic cylinders or pieces of smaller rocks under about one inch in size. Tumbling two of these large rocks would be rather safe if they are completely surrounded by small material; however, if you try to tumble three or more you run the risk of them producing hard impacts against one another as they tumble and those impacts might cause bruising or breakage. The Thumler's Model B is the perfect machine for tumbling our Super Mix. It consists of a variety of colorful crushed rock that often contains numerous types of jasper, agate, quartz and petrified wood in a size range between about 1/2 inch and 2 1/2 inches. Add about nine pounds of Super Mix, one pound of course grit, a pound or two of large ceramic media, and enough water to just barely cover the stones, to the Model B barrel and you are ready for Step One of a great tumble.